Steve Schertz, the Automotive Technology Director at South Elgin High School in South Elgin, IL is dedicated to providing learning opportunities for his students with a focus on state of the art automotive technology. High School Auto Shop classes are not as commonplace as they once were, but thanks to Schertz, South Elgin High students have had many opportunities to grow their wrenching skills. Current and past programs that the students have taken part in include the Hot Rodders of Tomorrow Engine Challenge, Skills USA, Ford Triple-A Challenge and the OTC Carburetor Challenge. 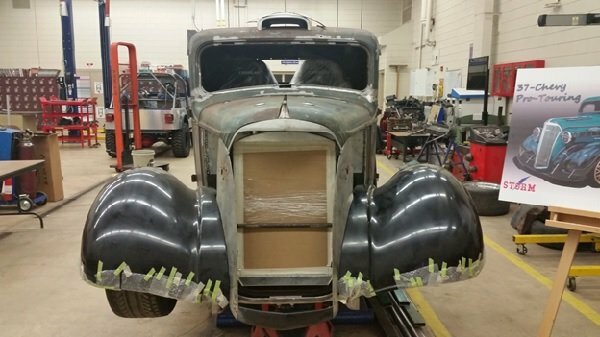 Steve’s crew recently caught our attention when we received info on the school’s latest project, a pro-touring 1937 Chevrolet truck. 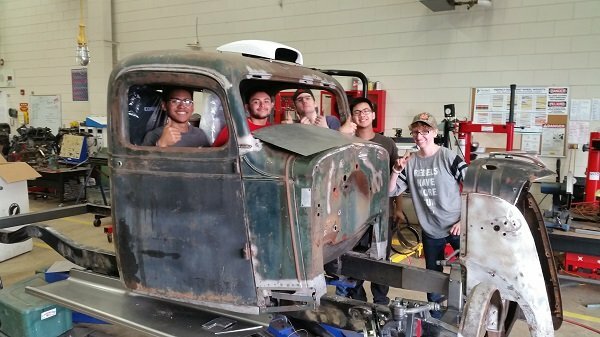 “Our most recent undertaking, building a SEMA quality pro-touring 1937 Chevy truck with modern performance characteristics, fuel injected, road race vehicle, challenges our students at an even higher level of technological expertise and engages them to work in teams to develop a more efficient and better performing vehicle,” said Schertz. Steve noted that the students would be handling 95% or more of the work done on the truck. 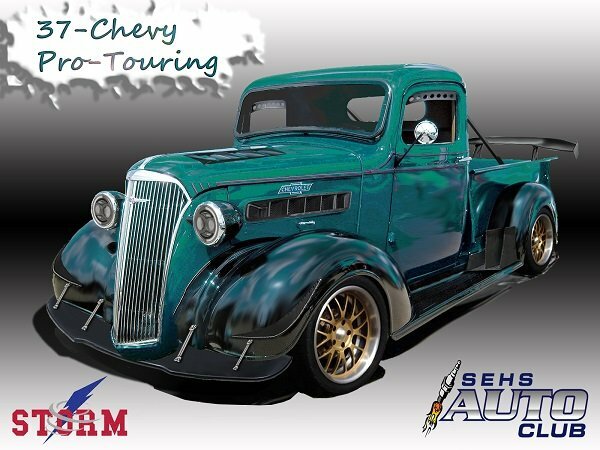 The Chevy, a tribute car to commemorate the previous owner and grandfather of the Instructor, will be powered by a 6.0L LS mill backed by a Hurst-shifted Borg Warner T-10 4-speed. Continuing back, an Eaton-locked Corporate 10-bolt rearend housing Richmond gears will be dressed up and cooled down by a cast aluminum B&M differential cover. 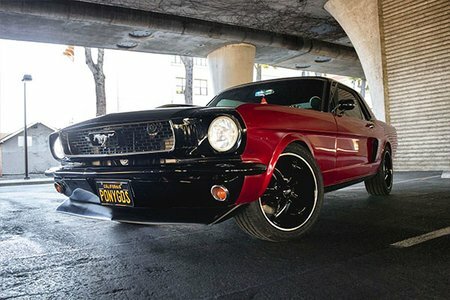 Of course, no pro-touring build is complete without a track-worthy suspension system. The truck will be lowered 4 inches after the students install a Heidts IFS and triangulated four-link in the rear. 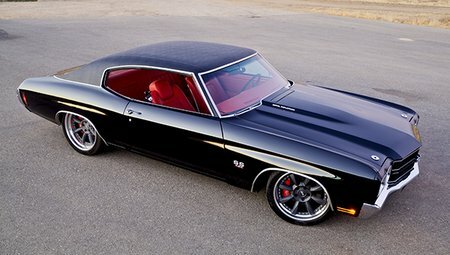 Rack and pinion chassis components, custom frame bracing, a Hurst Roll Control and 2.50″ Flowmaster U-Fit kit set off by a pair of Super 44 mufflers will round out the Chevy’s updated undercarriage and drivetrain. 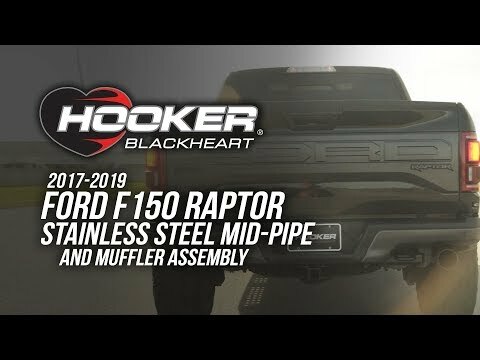 No doubt this will be a very unique truck. Shertz’ students are so engulfed in the build that they have even volunteered to work through their summer break to see the project through to completion. 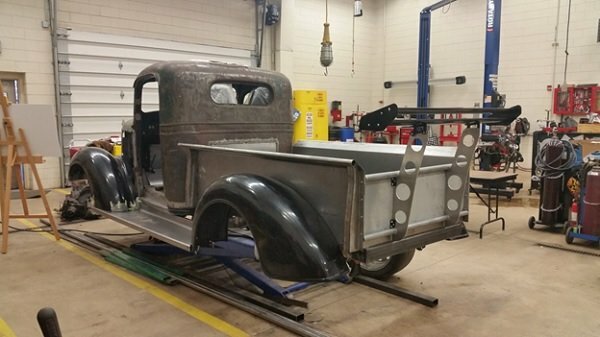 The students’ goal is to introduce this Chevy to the world at this year’s SEMA Show. If the dedication and talent of the young men and women led by Shertz is any indication of what’s to come, our guess would be that this corner-hugging restomod will be turning some heads in Las Vegas come November. Rodger Lee and the crew at Ironworks Speed and Kustom are leaders in high-end automotive fabrication. What began in a 900 square foot shop now encompasses a 10,000 sq. foot operating facility in Bakersfield, CA. Hard work, creativity, attention to detail and raw talent have set Ironworks head and shoulders above the rest and garnered the attention of automotive enthusiasts on the aftermarket’s biggest stage. Marilyn. Punch that name into Google and you’ll find info and images of one of the most well-known actresses and models of the 1950’s. Ask Wayne Wright who Marilyn is and you’ll receive a much different response.